Welcome to the Best Western Plus Fort Wayne Inn & Suites North! Business travelers with ITT Exelis feel right at home at this Fort Wayne hotel, as do vacationers who are in town for an event at the Allen County War Memorial Coliseum. Stay close to The Fieldhouse or enjoy extended stay rates for guests who are here for a term at Indiana University-Purdue University Fort Wayne (IPFW) or Ivy Tech Community College. Blocked rooms, spacious accommodations and stellar customer service make this property stand out. Our indoor hot tub and pool add a touch of luxury to any trip. The complimentary full hot breakfast ensures every morning starts with a gourmet fare. Plus, when youre so close to local attractions, its easy to make the most of your time in Indiana. Sporting tournament venues such as Spiece Fieldhouse bring fans and teams to town from around the world. The Plex is a favorite local venue and SportONE Fieldhouse is where many legendary games have been played. From events at the Allen County War Memorial Coliseum to the Fort Wayne Childrens Zoo, theres truly something for everyone nearby. Annual events like the Vera Bradley Outlet Sale are favorites of locals and travelers alike. When on business with General Motors Corporation or AT&T, you deserve to feel at home. Ernst & Young employees as well as workers with BAE Systems enjoy the short commute from our Fort Wayne hotel. With the Three Rivers Festival holding festivities all summer that include Junk Food Alleys live performances, bands and parades, mixing in some fun is easy. There are many attractions downtown such as the library, which has the second largest genealogy center in the U.S., the botanical gardens and of course The Historic Embassy Theatre and the Grand Wayne Convention Center. 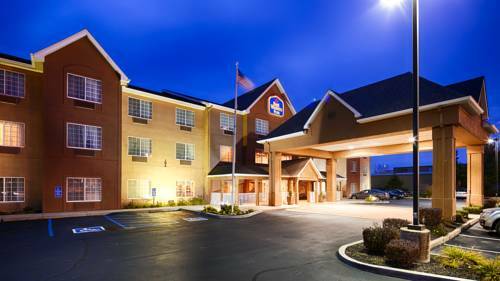 Reserve a relaxing stay at the Best Western Plus Fort Wayne Inn & Suites North right now and get the best rates! Enjoy your stay. Across the street from Switta-Thai Cuisine, full service, Thai, open for: lunch, dinner, offering a 10% discount to guests staying at the Best Western Plus Fort Wayne Inn & Suites North! 1.00 mile(s) from Asakusa Japanese Restaurant, full service, Japanese, open for: lunch, dinner, creating some of the best sushi found in the mid-west in a relaxed setting. 1.00 mile(s) from Texas Roadhouse, full service, steak house, open for: lunch, dinner, offering a 10% discount to guests staying at the Best Western Plus Fort Wayne Inn & Suites North! Miniature golf - 2.50 mile(s) from Putt-Putt Fun Center of Fort Wayne, miniature golf with three different, 18-hole themed golf courses, go-karts, an arcade with redemption center and over 70 of the latest games. Nightclubs - 2.00 mile(s) from Early Birds Ultra Lounge, symoblizes a new standard in Fort Wayne nightclubs. 1.50 mile(s) from Raytheon, from the depths of the ocean to the farthest reaches of space, from remote battlefields to the virtual realms of cyberspace, Raytheon technologies are deployed in more than 80 countries to deliver innovation in all domains. ~26 miles from Fort Wayne. ~47 miles from Fort Wayne. ~54 miles from Fort Wayne. ~55 miles from Fort Wayne.